Russia, China And U.S. Condemn North Korea's Nuclear Test Claims : The Two-Way Members of the UN Security Council "will begin to work immediately" on new measures to punish North Korea, the group said Wednesday. 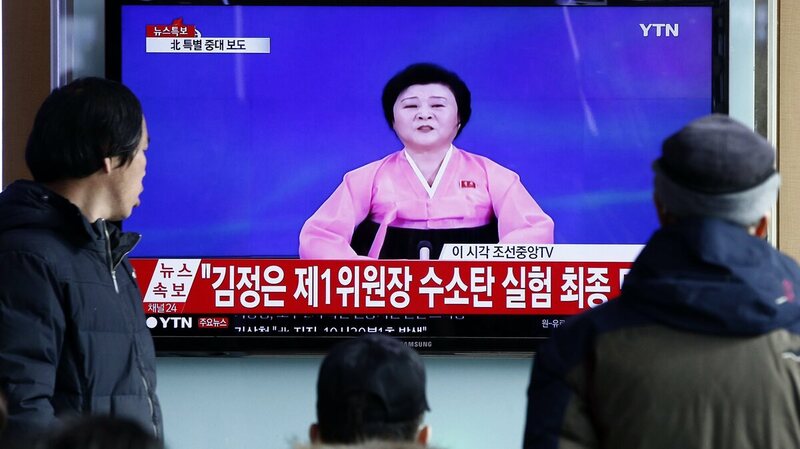 South Koreans watch a report on North Korea's TV announcement that it had successfully conducted a hydrogen bomb test. North Korea's neighbors have condemned the nuclear test, which is still being verified. With North Korea announcing it conducted a nuclear test of a hydrogen bomb, China, India, Russia and other nations are condemning the move. The U.S. says it has yet to verify the claim, but it also reiterated its stance that North Korea can't be allowed to become a nuclear state. News of the test was announced via state-owned Korean Central Television, which reports that North Korean leader Kim Jong Un personally ordered the test in December and gave final approval over the weekend. Last month, Kim said his country has developed a hydrogen bomb; experts remain skeptical of that claim. In North Korea, the news was deemed vital enough to warrant bringing veteran news announcer Ri Chun-hee, famed for her proud and powerful delivery, out of retirement. UN Security Council President Elbio Rosselli of Uruguay says, "The members of the Security Council strongly condemn this test, which is a clear violation of Security Council resolutions" from 2006, 2009, and 2013. Noting that the council had promised "further significant measures" if another test were performed, Rosselli added that the member nations "will begin to work immediately on such measures in a new Security Council resolution." South Korea will "make sure that North Korea pays the corresponding price for the nuclear test," President Park Geun-hye said in a National Security Council meeting Wednesday, according to Yonhap News. "China 'firmly opposes' the latest nuclear test conducted by the Democratic People's Republic of Korea (DPRK), according to a statement on Wednesday from the Chinese Foreign Ministry." — state-run Xinhua News. UN Secretary-General Ban Ki-moon says, "I condemn it unequivocally." The head of the UN's International Atomic Energy Agency says the test is "deeply regrettable." Japan's Prime Minister Shinzo Abe called the test "totally unacceptable," saying it "constitutes a grave threat to Japan's security" and violates U.N. Security Council resolutions. A U.S. State Department spokesperson says this would be North Korea's fourth nuclear test, adding, "We have consistently made clear that we will not accept it as a nuclear state." Russia's foreign ministry says that if the test is confirmed, it would be a new step for Pyongyang and a "flagrant violation of international law" that stand to aggravate tensions on the Korean peninsula. From India's Ministry of External Affairs: "It is a matter of deep concern that DPRK has again acted in violation of its international commitments in this regard. We call upon DPRK to refrain from such actions which adversely impact on peace and stability in the region. Our concerns about proliferation links between North East Asia and our neighbourhood are well-known." European Union Commission Vice President Federica Mogherini says: "If confirmed, this action would represent a grave violation of the DPRK's international obligations not to produce or test nuclear weapons, as determined by several United Nations Security Council Resolutions, and a threat to the peace and security of the entire North East Asia region." "The announcement followed a magnitude 5.1 earthquake that shook near the rogue nation's nuclear test site, Pyunggye-ri, at 10 a.m. local time. "The hydrogen bomb test was 'an act of self defense' against foreign threats, the announcement from the North said. 'We've joined the rank of nations with nuclear weapons. We won't use the nuclear weapon as long as there's no invasion of our autonomy.' "